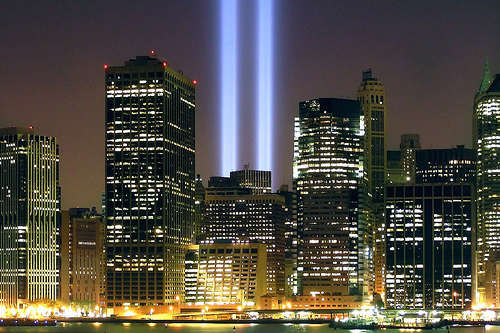 The 10th anniversary of September 11th is almost upon us, and I find myself strongly compelled to write about it. Every year around this time, we are faced with constant reminders of that tragic day. In recent years however, I have found myself trying to avoid them. I have dodged the documentaries and retrospectives, and declined to read the many stories and articles that invariably surface. As I felt myself slipping into that mode again this year, I stopped myself and asked: why? The answer seemed straightforward: I had been hiding from the powerful emotions that are inextricably tied to September 11th, 2001. However, that raised other questions: why are my emotions so strong, and why am I trying to avoid them? I didn’t lose any family or close friends on that day. I wasn’t actually in the World Trade Center, or among the multitudes that responded in the weeks and months that followed. On the surface, it might not seem reasonable that it had such a lasting impact on me. It did. I felt ashamed that I was avoiding the memory of that day, because even though it is cliché, remembering is one of the few things we can do. I felt selfish trying to avoid some small amount of personal pain, but I wondered how many others have a similar tendency. On the cusp of 9/11/11, the anniversary a full decade later, I have decided that there has been enough hiding. It is time for me to remember. 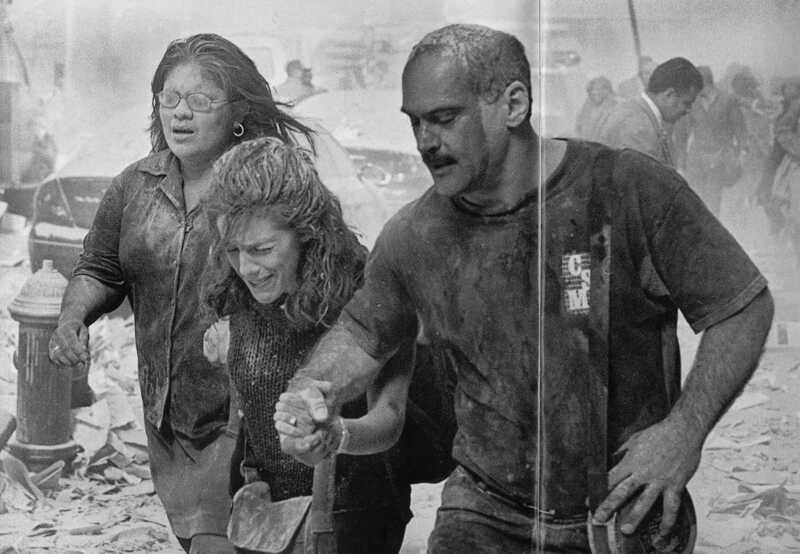 I was an ordinary, civilian resident of Manhattan for about 7 years, and I was in the city when the towers fell. That phrase, “when the towers fell”, sends shivers up and down my spine and causes me to choke up a bit, even now. My fiancé and I occupied a small studio apartment on West 57th street, and on that Tuesday morning we were both at home. Neither of us were working because we were going over final preparations for our wedding, to be held in three days, on Friday September 14th. We were reviewing seating charts on the floor, listening to the radio. I was distracted, but I caught something about an explosion at the World Trade Center. The news sent a jolt of electricity through my body, and I scrambled to turn on the TV. Smoke and flames were coming from a large, jagged tear near the top of one tower. Was it possible that everyone working in that section of the building had survived? A slightly sick feeling accompanied my answer… not a chance. A few short minutes later, I watched in disbelief as a full size passenger jet crashed into the south tower and burst into an enormous fireball. In that instant, everything changed: a merely sensational news story had become a world-changing, life altering event. My fiancé was visibly upset; I tried to reassure her, but I have no idea what I said. I kept imagining myself as a passenger on that plane, screaming silently as it approached the building. Simple geometry dictates that a passenger wouldn’t see what was coming, but in my nightmare it made no difference. I don’t know what drove me to this visualization, but it was a pattern I repeated throughout the day. Soon we started to hear reports, and see images, of people jumping from the building. I tried to process this, and it led to disturbing thoughts. Flames fast approaching in the darkness filled with, thick choking smoke. There is no way out. It must have been so terrifying, to impel so many to choose certain death. What goes through your mind as you hurtle toward the ground? Do you really black out, mercifully, like they reported on the news? I felt nauseous, and I hugged my fiancé. After the third plane crash at the Pentagon, we started to hear early reports of hijacking. Terrorists… it must be. We have been attacked. It didn’t happen immediately, but at some point outrage and hatred fueled thoughts of revenge. A lot of ugly emotions were swirling around in my head. I saw myself enlisting in some branch of the armed services to strike back at this unnamed enemy. I knew it was unlikely for a number of reasons, but I ignored that fact. Time had become a very hazy dimension. I know now it was about 10 am when I watched an enormous explosion shake the South Tower, obscuring it with smoke and debris. It wasn’t clear for several minutes exactly what had happened, but the entire building was gone. One of the world’s most iconic structures had crumbled to dust on live television. I felt raw horror; again I imagined myself as one of the thousands of human beings in the building as it collapsed. Did they know it was coming? I am pretty sure I started to cry, as did my fiancé, and again we hugged. It was at almost the same time that the fourth plane crashed, in an empty field in Pennsylvania. It would become one of the most uplifting stories of the day, but I almost overlooked it at the time. When it was retold, I fixated on the cell phone calls made by the passengers. They troubled me; that communication with loved ones immediately before death, a blessing and a curse for both ends of the conversation. Thirty minutes later, the North Tower collapsed, much more visibly this time. 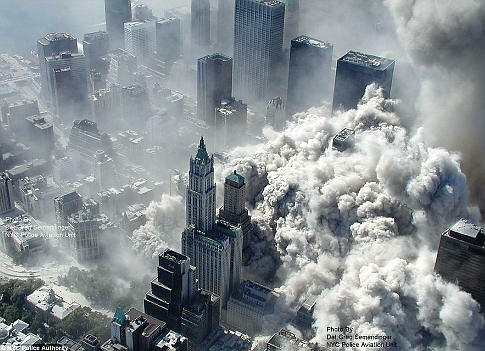 The Twin Towers were forever gone… brutally erased from existence, replayed in video throughout the day. I felt a horrible pit in my stomach, a sense of dread that was almost physical. The mind goes funny places at times like that, it seems. I remembered a field trip I had taken as a boy living upstate, standing in the plaza between the two giant towers, staring up in awe. They were so tall and so straight. No school child would ever have that view again. I remembered also a big company holiday party we had attended at Windows on the World, an incredible space that looked out over magnificent views of Manhattan. Now it was shattered into a million pieces; it is strange and unpleasant to contemplate the inexistence of places you have been. Of course, unpleasant isn’t a good word to describe thousands of people murdered in the space of 2 hours, a few miles from your bedroom. There are no good words for that. A degree of numbness had started to set in. I emerged later in the day to visit the roof and watch the smoke drift upwards from downtown. At some point, pedestrians covered in soot, who had been at or near Ground Zero, started to trickle up Broadway near our apartment. It brought this disaster, already so very close to home, that much closer. The city was shell-shocked; there was a quiet stillness that I had never seen before, and have never seen after. It was truly surreal, in a very bad way. My experience on that day was a trauma shared with several million New Yorkers (and others), many of whom had a far more disturbing vantage point. The difference for me was our impending wedding. My fiancé and I had spent the summer planning and preparing for the event, including visiting many reception venues. One of those we had looked at was a place in Chelsea Piers, and a large part of that area would be used for a temporary morgue on the very day of our wedding. Ultimately we had decided on a place in Long Island, close to my wife’s family, for which we were later thankful. That night and the following day, we had long discussions about canceling our wedding; we talked to our immediate family as well as our friends. Other than the obvious logistical challenges, there was the question: how can we celebrate anything so close to this event, much less the start of our life together? We worried that our wedding would be gloomy and depressing, and there was a guilty feeling associated with even having that thought. Ultimately, despite the fact that about 60 of our 230 guests could not come because of the ban on air travel, our wedding occurred as scheduled. Whether it was a conscious decision or just the momentum of months of planning that carried us through, I am not sure. For most of those in attendance, it was the first extended period away from constant exposure to images of death and disaster. People had spent the previous three days largely isolated, with feelings of sadness, disbelief, horror, and outrage. I vividly recall our Priest (we had an interfaith ceremony with two clergy) arriving barely in time, exhausted from having spent the entire day presiding over funeral services for fallen firefighters. That night, despite the awkward and strange juxtaposition of joy and tragedy, something powerful occurred. There was an overwhelming sense of celebration, of shared elation, the likes of which I wonder if many people have ever felt. I don’t know that it could ever be recreated, and I hope it never is, at least under similar circumstances. While I truly believe our wedding was beautiful and amazing and special, I know that particular feeling was the result of something more. It was the coming together of friends and family to celebrate life against the backdrop of unthinkable horror, and our blessed union was a proxy for all the good and joyous things that life holds. We were dancing, laughing, and drinking the night away as if there were no yesterday and no tomorrow, enjoying life fully in that moment. To many of us, it was also a living statement of defiance to those who had attacked our country and our way of life: no evil, no matter how bold and shocking, could prevent us from the triumph of that celebration. It was akin to the pure beams of light that rose out of the ashes of ground zero, illuminating the way to the heavens, far too bright for any darkness to overtake. I remember the thousands of people who lost their lives that day for simply living a free life. I remember the countless families and friends that suffered unthinkably, and still suffer to this day. I remember the courage of those first responders who selflessly risked their lives to save others. I remember the brave people who died trying to fight back. I remember the tireless efforts of those who worked to recover and rebuild. I remember the cowardice and evil of those that planned and carried out the attacks. I remember the men and women of the United States military and armed forces around the world who fight an ongoing battle, many of whom have lost their lives. I remember the pain, and the sadness, and the anger that I felt, and still feel to this day. I remember what is important in life. And I remember that while mankind may have great capacity for evil and darkness, I have personally seen the unbreakable will of the human spirit triumph over that darkness. A mutual friend posted a link to your blog on Facebook and as I read it I found myself sharing many of the same feelings and thoughts as you. I too have found it easier to remember dicreetly and quietly, mostly avoiding the pain of 9/11 memories. Coincidentally, my wife and I had our wedding on 9/15/11, just one day after yours. We too had explored variuos venues in lower NYC including Chelsea Piers, before ultimately deciding to marry on Long Island as well. The decison to move forward with our wedding was a tough decision but it was our rabbi who persuaded us explaing that it was actually a Jewish tradition to not let tragedy defeat celebration and the need to move forward. Like your wedding celebrations, ours had a magical strange feeling as though everyone attending had their first chance in many days to smile, laugh, and feel good. The bandleader told us later that night that he had never seen such emotion and energy froma wedding crowd. I think you nailed it perfectly by saying that the celebration was “a living statement of defiance to those who had attacked our country and our way of life: no evil, no matter how bold and shocking, could prevent us from the triumph of that celebration.” Thank you Michael for your blog, and thanks for reminding me to REALLY remeber this year. @MarcWeissman327 – Marc: Thanks so much for leaving your comment. I am really glad that this post helped you ‘remember to remember’; it is good to know that other people feel so much alike in this regard. You are the first person I have heard from that had a similar experience with a post 9/11 wedding; I assume there must be plenty, but I have never met one! I am glad you shared that same positive, magic feeling during your wedding… it was really so wonderful in the face of such tragedy. Happy Anniversary to you and your wife! I am watching History Remembers 2001 – 2011, on the history channel. It is impossible to keep my eyes dry. One thing I didn’t mention in my post that touched me deeply then and now: the support and solidarity shown by the rest of the free world in the days following 9/11. A clip of British royal marching band playing the Star Spangled Banner for a reverent crowd hit me particularly hard.